Good morning! Welcome to The Morning Shift, your roundup of the auto news you crave, all in one place every weekday morning. Here are the important stories you need to know and that you better read or else. Ah, remember yesterday? We were calmer, having friendly debates—is the death of diesel imminent; what does it mean that car sales are dropping—not thrusting ourselves into a frenzy as if we’re barreling toward a dark place. While net new drivers jumped to 4 million in 2015, that may not be enough. 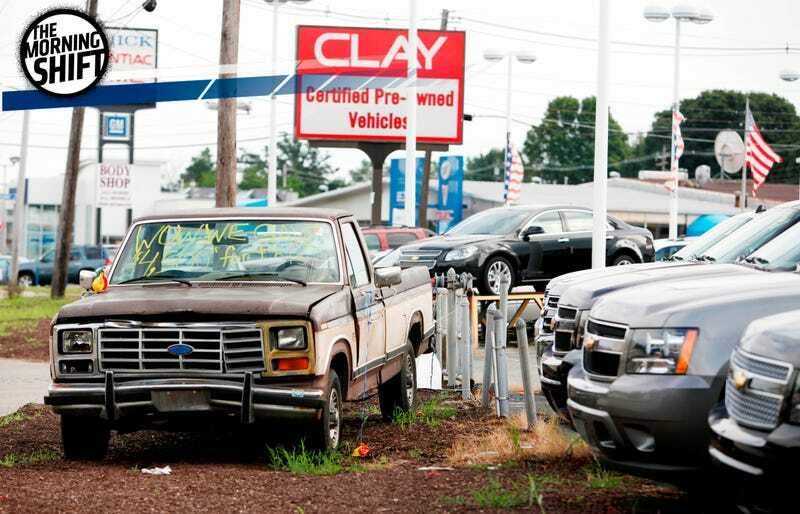 Total vehicles in the U.S. have increased to 270 million, from 249 million at the end of 2012. So, yeah... about those shiny new U.S. auto factories. And that’s the thing about “mobility,” right? It’s not just about producing the vehicle that moves anymore, it’s providing the service: That’s why General Motors bought into Maven and Lyft, Ford with Chariot, Uber with... Uber. With Mercedes, you now have a jam-packed that makes the future success of services we now see as viable not as likely. Mercedes wants its fully-autonomous car on the road, picking up passengers by 2021, which tracks with Ford’s ambitions. Now it’s just up to the automakers to make it happen. Where there’s mobility, there’s reigning champs Uber and Lyft. And both despise an ordinance crafted by Seattle’s city council that allowed drivers for the ride-hailing services to unionize. Uber and Lyft felt Seattle’s idea wasn’t fair to its drivers and their freedom (and every argument you can conceive other than explicitly stating “it’ll hurt our business model). The ride-hailing business model is couched around a standard operating procedure in the so-called Gig Economy: workers aren’t your “employees,” they’re contractors. But a successful union drive could change the stakes; Uber, for one, has indicated it won’t put up with it and said it’ll leave the city if drivers go that route. Saying the city’s ordinance would likely disrupt the ride-hailing companies’ businesses in “fundamental and irreparable ways,” [U.S. District Judge Robert] Lasnik ruled that it should be blocked while the case is decided. “There can be no doubt that ride-share companies such as Uber and Lyft have, at a truly startling rate, created havoc in this industry using a business model that simply did not exist before its recent technological development.” Lasnik wrote. The judge said it was uncertain, though, whether state law allows the city’s ordinance. The Seattle city attorney’s office will continue fighting to “defeat this legal challenge to its effort to improve the safety and reliability of for-hire transportation in the city,” spokeswoman Kimberly Mills said in a statement. “The city is also encouraged that the court did not find merit in the challenges to the ordinance under federal labor law,” she said. A Lyft spokesperson told Bloomberg the ordinance is a “poorly drafted law that could undermine the flexibility of drivers” options, while Uber’s general manager in the Midwest said it poses an “imminent risk” to drivers, and the people of Seattle. Whatever the case, Lasnik stressed the ruling was only temporarily, and his opinion in no way suggested the chamber might prevail. So this’ll be interesting to follow. U.S. automakers and President Donald Trump have established a firm relationship with one another, with Trump urging them to build new domestic factories and bring jobs back to the country. Thanks to some carefully-crafted PR maneuvers, automakers have indeed changed plans to build in Mexico and relocate some business back to the U.S. That’s left some parts of our neighbor to the south without factories it expected. Chinese automaker Great Wall Motor Co Ltd... is considering building an auto plant in two Mexican states hit by U.S. President Donald Trump’s drive to make American companies invest at home, sources said. Great Wall Motor, which describes itself as China’s largest SUV and pickup manufacturer, is interested in building a plant in Nuevo Leon in northern Mexico or the central state of San Luis Potosi, three people familiar with the matter said. Under pressure from Trump to keep jobs in the United States, Ford Motor Co (F.N) in January canceled a $1.6 billion plant in San Luis Potosi, while heating and air conditioning firm Carrier in December scaled back plans to move production to Nuevo Leon. Great Wall Motor officials met with Mexico’s top railroad firms, Ferrocarril Mexicano (Ferromex), part of Grupo Mexico (GMEXICOB.MX), as well as Kansas City Southern de Mexico [KCSM.UL](KSU.N), to evaluate the states’ connectivity, according to a source and two documents seen by Reuters. But Great Wall says this all hinges on one major unanswered question: U.S. trade policy. Hm. Barra’s total compensation for 2016 was slightly higher than the $22.1 million earned by Ford CEO Mark Fields and the $11.99 million owned by Fiat Chrysler Automobiles CEO Sergio Marchionne. Barra, who became CEO in January 2014, is the auto industry’s first female CEO. The value of her total compensation fell by about 21% last year. The biggest difference was that Barra did not receive any new stock options awards in 2016 compared with $11.2 million in stock options in 2015. I just did the math, in the time it took me to write this gear, Barra would’ve earned $205. I... did not. It seems clear that auto sales will taper off in 2017, but do you think we’re barreling toward another “triple threat”-type situation?